The Kurgo Carrier Keeper is a simple way to secure your pet crate while travelling. 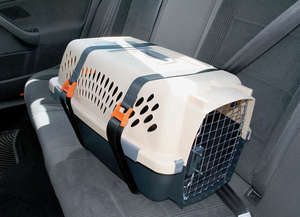 Many cats and dogs enjoy using their crate – at home and in the car. Now the Kurgo Carrier Keeper allows you to buckle up your pet while they are still in their favourite carrier to keep them secure while you drive – free of distraction. Best of all it works with any carrier that fits on your car seat, utilising the car’s seatbelt as a restraint. The Kurgo Carrier Keeper can be fitted easily and improves car safety for you, your passengers and your pet. 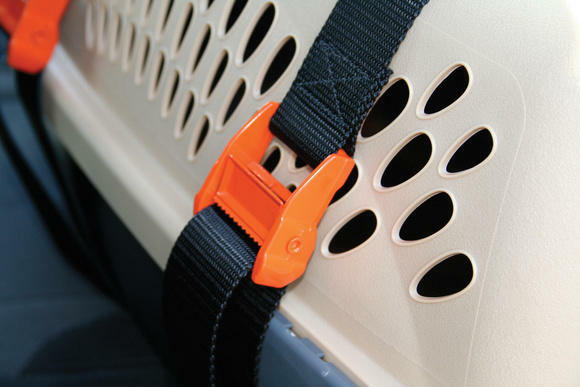 You simply slip the seat belt through both carrier keeper straps and then follow with your seat carrier or crate. Once everything is snug, you and your dog are ready to ride knowing your pet is safe and secure without compromising any of those original carrier comforts. Compatible with all seat belts and carriers that fit on your car seat. Caution: Always check seatbelt straps and closures for damage or signs of wear before you leave for your trip. Make sure your dog always has proper ventilation and never leave them alone in your vehicle.